Many women often experience the somewhat peculiar sensation of tingling and numbness in their feet, legs, arms, and hands. In women, this common disorder is usually a relatively harmless side effect of fluctuating levels of hormones. Despite this, tingling extremities are enough to interrupt normal quality of life. While most cases of tingling extremities don't signify a serious condition, it would be wise for women who are experiencing them to learn more about it. Continue reading to learn everything about tingling extremities, including its causes, risk factors, symptoms, prevention, and treatment options. Tingling extremities commonly occur as a result of nerve compression or damage. These sensations feel like arms or legs are just recovering from “falling asleep”, or being pricked by tiny pins. 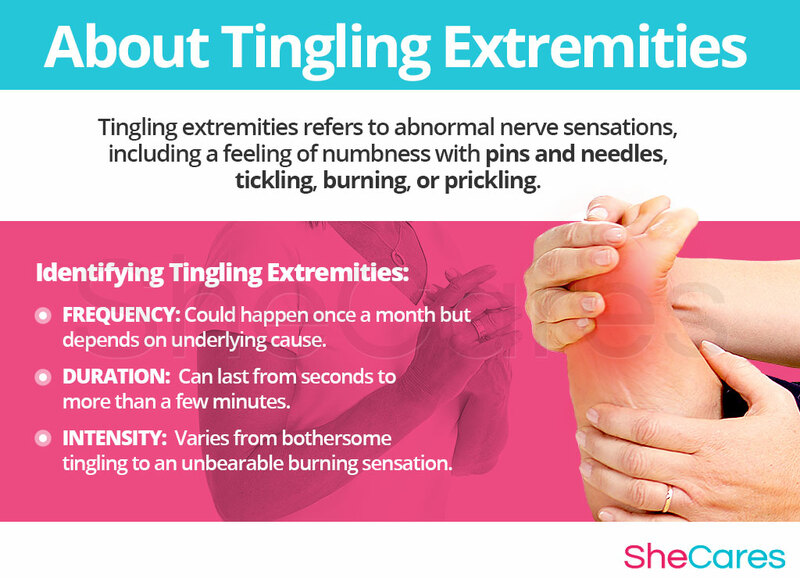 Tingling extremities refers to a feeling of numbness with pins and needles, tickling, burning, prickling, or similar abnormal nerve sensations, which are classified as paresthesia. These sensations can be experienced all over the body, but they are most common in the extremities, i.e., the arms, legs, hands, and feet. However, some women report feeling these symptoms in other body parts, such as the face and neck. Paresthesia is a condition commonly caused by imbalanced hormones. This means, for example, that it can occur on a cyclical basis in tune with a woman's menstrual cycle as a symptom of premenstrual disorder (PMS). In this way, tingling extremities are also commonly experienced during typical phases of hormonal imbalance during a woman's lifetime, such as puberty, pregnancy, post-partum (including breastfeeding), and menopause. However, paresthesia is also a symptom of a variety of mild to dangerous disorders and conditions, such as infections, inflammation, trauma, malignancy, and a host of other abnormal processes. Tingling extremities are not gender specific as they can be symptomatic of underlying problems in both men and women. In women, it is a common side effect of fluctuating hormones. Therefore, it is likely that these inconvenient episodes are just a normal, albeit unwanted, element of some women's pregnancy and menopausal stages. While incidents can vary from person to person, tingling extremities can still be identified accordingly. However, these nerve sensations can be indicative of other more serious conditions. 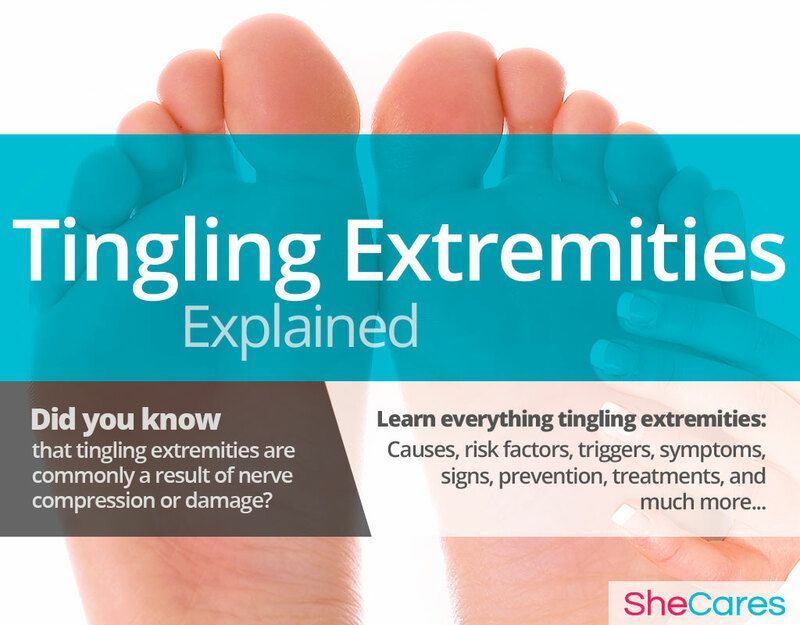 Keep reading to learn about the complications associated with tingling extremities. While these causes are some of the most likely to be the reason behind your tingling feet, they can be affected by other factors. For instance, temperature is one of the biggest factors that can affect tingling and numb feet - blood circulation problems in particular are likely to become worse in the cold. Tingling extremities, or paresthesia, can occur at any time. In more common and mild cases, tingling extremities can come about after a certain body posture pinches a nerve or presses on an artery, causing a limb to temporarily “fall asleep.” In these cases, the tingling extremities usually return to normal after compression is relieved. However, numbness and tingling sensations that are not so easily relieved could be symptomatic of a more serious problem, such as changes in hormone levels. In addition, there are a number of other medical issues which can cause paresthesia. Keep reading to discover the hormonal and other causes of tingling extremities. Hormones are chemical messengers that control every organ in the body. When fluctuations arise, organs don't receive the correct signals to function effectively and hormonal disorders occur. Therefore, tingling extremities are caused largely by the hormonal fluctuations that take place during the transitions women experience throughout reproductive life. Numbness and tingling sensations in the extremities can also be explained by natural hormonal changes and fluctuations. This is because estrogen, a hormone greatly influenced by the different phases of a woman's reproductive life, has a complex and widespread effect on the central nervous system. Another of estrogen's jobs is to maintain the skin's vitality and suppleness. Receptors of this hormone located in the skin enable estrogen to attract greater blood flow to the skin and stimulate production of collagen. However, during times of hormonal imbalance, estrogen levels may be depleted, leading to thinner skin, which is more susceptible to cracking and wrinkling. Weak skin also becomes more sensitive, giving way to tingling, burning, or numb sensations. Thus, fluctuating levels of estrogen make women more susceptible to tingling extremities. Hence, this is the reason why more women experience this symptom during times of significant hormonal flux, such as puberty, pregnancy, post-partum, and menopause. Puberty is the stage in which a girl's body begins to produce reproductive hormones; these and other factors, such as school and dating pressures, contribute to tingling extremities during puberty. Pregnancy leads to extreme changes in the production of reproductive hormones, which along with other factors, like fatigue or bodily changes, can lead to tingling extremities. Postpartum and breastfeeding is another stage where reproductive hormones are imbalanced, leading to symptoms like paresthesia. Also, other factors contribute to tingling extremities in post-partum, like fatigue or blood loss. Menopause is the stage in a woman's life when production of reproductive hormones naturally declines, signaling the end of a woman's fertility. As well as hormonal causes, other factors add to the reasons for tingling extremities during menopause, including loss of collagen and weight gain. While tingling extremities in women can usually be attributed to hormonal imbalance, these sensations can sometimes be a symptom of another condition. Continue reading to learn more about the other causes of tingling extremities. In a majority of cases, the numbness and tingling sensations can be explained by natural hormonal fluctuations. Although this is quite common, there is a long list of other medical conditions that can cause numbness and tingling in the extremities, such as nerve injury, anxiety, fibromyalgia, or a stroke. Read on to learn about the risk factors and triggers which also have a bearing on when women experience tingling extremities. Some women are more likely than others to suffer from tingling extremities for inherent health reasons. These predisposing factors can affect a woman's hormone levels and increase the chances that a woman will develop tingling extremities during her reproductive life. 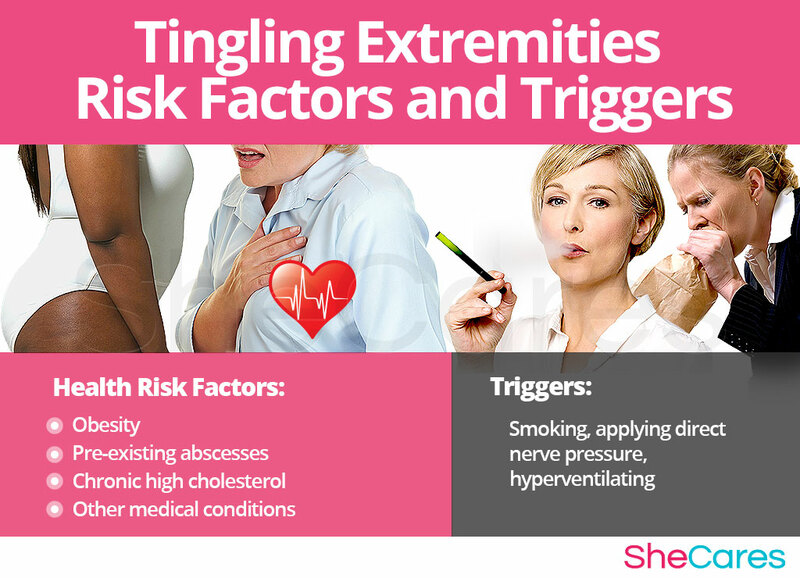 In addition to long-term risk factors, tingling extremities can also be triggered by certain environmental phenomena and behavioral habits. Avoiding these environments or habits as much as possible may help to avoid the onset of these symptoms. Tingling extremities are caused by hormonal imbalances, underlying medical conditions, physical problems, or everyday habits. There are also medical signs of tingling extremities that can be assessed by a doctor. Continue reading to learn more about the indicators of paresthesia. Tingling is often not a symptom of a life-threatening condition, but there are rare cases when tingling is what can alert you to the possibility of a tumor or a stroke. If you are experiencing other odd symptoms along with your pain and tingling, look into the possibility of these other conditions. Tingling or Numbness in Left Arm: Should I Be Worried? Tingling and numbness are often symptoms of other medical conditions, but they themselves also have a medical name: paresthesia. Generally, paresthesia refers to a prickling, tingling, or crawling sensation that occurs without any pain, but it is possible for paresthesia to be present with a burning sensation or small sharp pains. Some women may suffer from a number of these physical symptoms while others may experience only one or two. However, many women suffering from hormonal imbalance will suffer from a combination of these symptoms, albeit with differing intensity and frequency. To reach a diagnosis of paresthesia, a doctor will need to check several aspects of a patient's health, such as medical and family history, physical symptoms, and, if necessary, hormone levels through blood testing. In a minority of cases, tingling extremities may lead to complications which are riskier to a woman's health. However, it is important to keep in mind that in the great majority of cases, tingling extremities are a sign of hormonal imbalance or incorrect posture and will not require any serious medical intervention. Some of the possible, but rare, complications of tingling extremities can include loss of sensation in extremities and increased risk of falling, which might persuade women to seek treatment or ways to manage the condition. 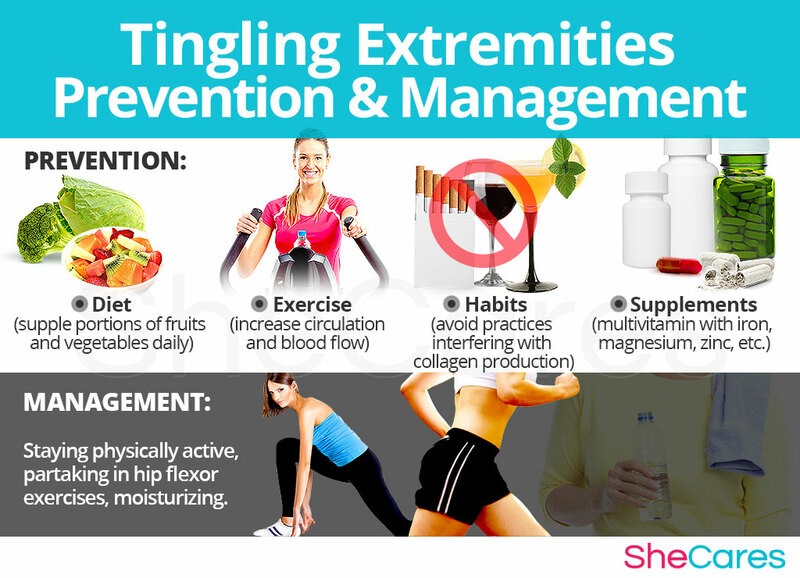 Women who are worried about the potential complications of tingling extremities should consider prevention or management techniques for the condition. Keep reading to discover some of these measures. While there is no single way to completely prevent tingling extremities, just as there is no way to stave off natural hormonal processes, there are a few steps that a woman can take to lessen her chances of developing severe or frequent symptoms of skin paresthesia or to minimize the frequency of its episodes. Lifestyle changes for prevention are extremely important, especially with regard to diet, exercise, and healthy habits. Moreover, women may seek ways to complement these lifestyle approaches with the use of supplements that help enhance the endocrine system and, therefore, help prevent or ease symptoms of hormonal imbalance. For women who are already going through the disorder, prevention may not be possible if tingling extremities have already appeared. Fortunately, there are many ways to manage them in order to prevent these “flare-ups” or to lessen the intensity of the symptoms. Keep reading to learn about the different ways to manage tingling extremities. It is common for women to find that the sensation of “ants crawling” or of “having a leg falling asleep” tends to happen in very diverse scenarios. Fortunately, there are certain tips and tricks available that can help improve the experience and give women the tools they need to cope with it. Alternative treatments are also a great way to manage tingling extremities. These treatments will not tackle the hormonal cause behind most women's tingling extremities, but they are effective in reducing stress in the short and medium term. Alternative treatments include massage, acupuncture, and biofeedback. While these measures often help to reduce the frequency and intensity of tingling extremities, they are unable to treat the root of the problem, which in most cases is hormonal imbalance. However, there are several natural treatments that can treat the hormonal causes of tingling extremities. 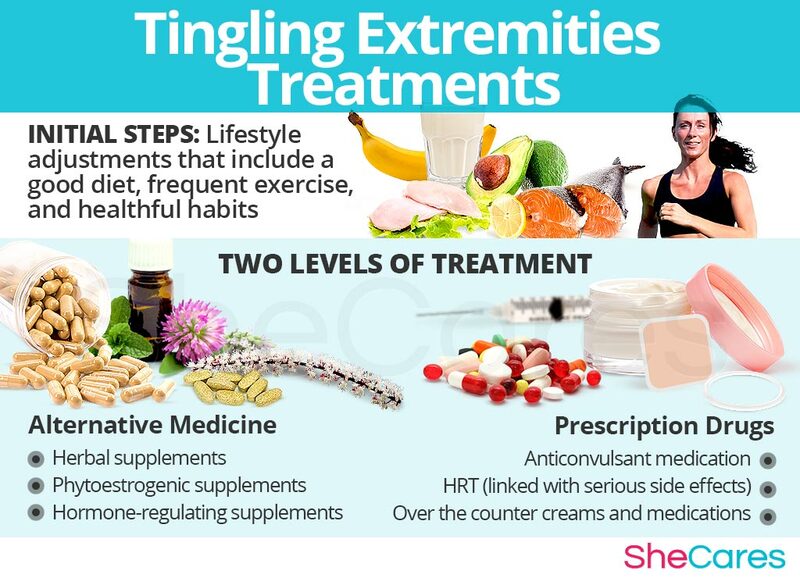 Please continue to the next section to learn more about treating tingling extremities. Keep reading to discover approaches to treatments for tingling extremities. 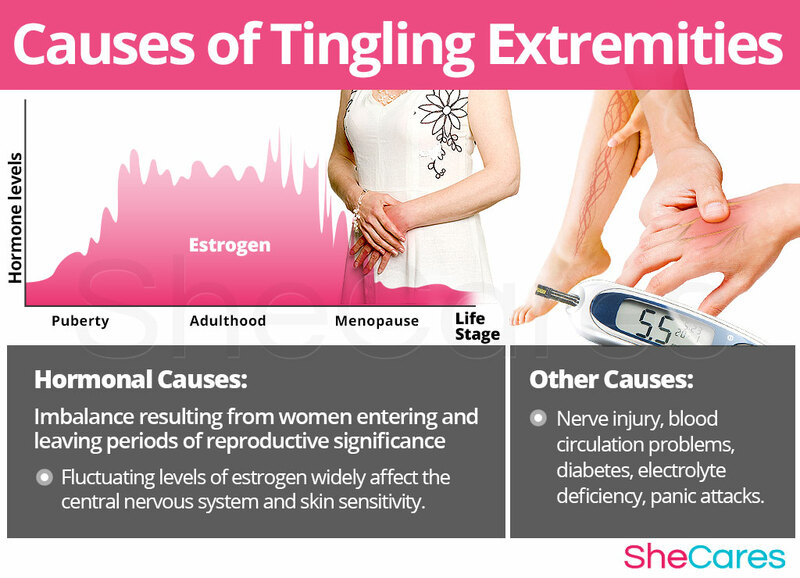 Tingling extremities are a common consequence of hormonal imbalance, and they can be frustrating for any woman who experiences them. However, some cases are so severe that they begin to interfere with daily life. Fortunately, it is more than possible to find an effective treatment for skin paresthesia. Three levels of approaches can be considered for treating tingling extremities. These are categorized as: (1) Lifestyle Changes, (2) Alternative Medicine, and (3) Pharmaceutical Options. As with any health concern, it is best to begin with the least aggressive treatment option and then move on to the next only if relief is not attained. In most cases, a combination of lifestyle changes and alternative treatments are the most effective and safest approach to treat tingling extremities with moving on to pharmaceutical options at the advice of a doctor if nothing else seems to work. This primary level of treatment involves the least amount of risk, though conversely it requires the highest amount of self-discipline. Often simple changes in lifestyle can reap huge benefits in achieving a higher overall level of health. Fundamentally, an improved diet, regular exercise, and healthy habits can do a woman great service. While these changes will help alleviate the symptoms, they do not directly address hormonal imbalance, a common cause of tingling extremities. Therefore, further treatment may be necessary. Alternative medicine has proven to be an excellent way of treating tingling extremities related to hormonal imbalance in a safe and natural way. Alternative medicines and supplements involve little to no risk and can be an extremely effective way to treat tingling extremities. In the case of herbal supplements, there are two main types that can be used: phytoestrogenic and hormone-regulating herbal supplements. These supplements, such as black cohosh, contain estrogenic components produced by plants that complement the low estrogen hormones in a woman's body, helping alleviate tingling extremities. By introducing plant-based estrogens into the body, these herbs treat the underlying estrogen deficiency behind this uncomfortable symptom. These supplements, including Macafem stimulate the body's natural hormone production by nourishing the pituitary and endocrine glands, helping the whole hormonal system produce hormones more efficiently. This ultimately results in balancing not only estrogen, but other important hormones such as progesterone. These supplements can be considered the safest and most natural way to treat the underlying hormonal imbalance behind tingling extremities and can be taken throughout a woman's life as they support the body's natural hormone production. Additionally, there are some other types of supplements that can also alleviate tingling extremities, or at least make them more manageable, including vitamins and other herbal supplements. The most effective route to heal tingling extremities without exposing the body to unnecessary side effects and risk is to combine lifestyle changes with alternative medicine. This will provide a faster relief from the symptom and at the same time deal with the underlying hormonal imbalance. However, for some women the symptoms may be so severe as to require more drastic treatment. Interventions at the third level involve the highest risk and often the highest costs. Not all treatments are suitable for women at every life stage. So, it is strongly recommended to speak to a licensed healthcare practitioner before starting any pharmaceutical treatments for tingling extremities. There are a couple main types of pharmaceutical options that can be prescribed to treat tingling extremities, two of which are hormone-regulating medication and anticonvulsant medication. These three approaches are not mutually exclusive. A woman may use different approaches at different times or any combination of them, depending on the duration and severity of symptoms. Nevertheless, today, more and more women find that dealing with hormonal imbalance symptoms is best accomplished via a combination of healthy lifestyle and alternative treatments.